While writing about seeing the gifts in people and events I remembered one of my favorite scenes in Love Actually (2003). 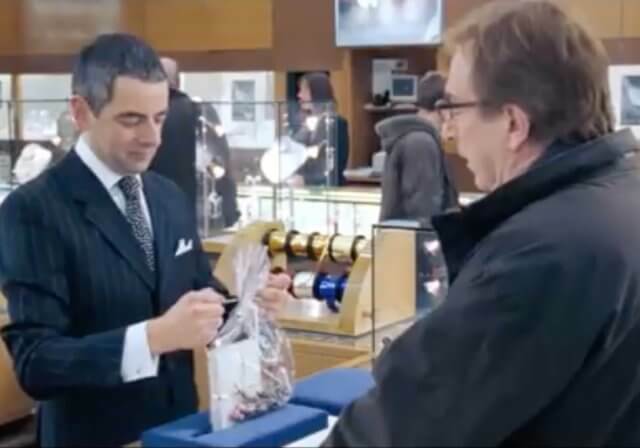 With his wife shopping nearby, Harry (Alan Rickman) impulsively purchases an expensive necklace for his mistress — only to be tortured by the fear of discovery as Rufus (Rowan Atkinson) slowly wraps his gift. Watch the 2-minute video clip. Discussing this amusing scene, my wife pointed out that the two components of a present, a gift and a wrapping, suggest a metaphor for an event. The gift symbolizes the purpose of the event — the connections made, the learning that takes place, the consequent outcomes. The wrapping equates to the logistical necessities and sensory glitz that makes the event viable (people need to eat and drink, have somewhere to stay, and enjoy being entertained or impressed). The answer to “what’s most important about a present, the gift or the wrapping?” is easy. A beautifully wrapped empty box is at best a joke, at worst an insult. A naked gift, shorn of all wrapping, is still a present. And yet, all too often, we attend events that are like beautiful yet ultimately disappointing boxes of chocolates. The wrapping is gorgeous. Our excitement mounts as we open the box, only to discover that the chocolates are missing, sparse, or stale. As an event designer, I frequently hear that there’s “no budget” for meeting process design. Design that would make an event fundamentally better by significantly improving the realization of its purpose. Curiously, there always seems to be enough money budgeted for meeting logistics: the nice venue, F&B, fancy decor and AV, and the seemingly obligatory entertainment and big name speaker(s). That’s sad, because competent meeting process design costs far less than any of these traditional logistical components. When we design and implement an event, its purpose must remain at the center of our attention, energy, and budget. If we focus on the wrapping at the expense of the gift, our events will be a tragic waste of everyone’s time.